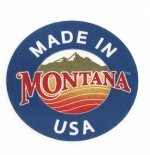 Our Flynn Family has been quilting for 111 years; (oh, my gosh!) 41 for Brooke, 39 for John and 31 for Kate who entered her first quilt show at age 8. That's a lot of enjoyment and creativity along with frustration at times; broken needles, tangled thread, blocks or borders that don't work, but mostly just pure pleasure and relaxation at a time honored art. Along the way, John Flynn started making a scroll hand quilting frame for family and friends. Many happy hours were spent hand quilting on that first scroll frame; a compact and easily stored beauty with cherrywood ends and pine rods. As machine quilting became more and more popular, John, the engineer, was intrigued by the idea of making a no-baste scroll frame to use on a home sewing machine. Proto types came and went and, after many versions and hours spent trying the frame, success! 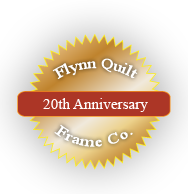 The first Flynn Multi-Frame was introduced at Spring Quilt Market in Minneapolis in 1996 and was granted a U.S. Patent in 1999. Thousands and thousands have been sold; to quilters all over the world. There is no basting with the Flynn Multi-Frame System. The tension system tightens right to left or left to right so all the layers of the quilt sandwich are tight; independent of each other so there are no puckers in the quilt back. The frame can be taken off the sewing machine and stored away, even with the frame ends removed, in just a matter of minutes. The frame holds all the layers of the quilt out of the way so a quilter can concentrate on quilting instead of bunching, re-rolling or gripping the roll of quilt. The Multi-Frame can be made any length a quilter needs by adding inexpensive, easy to find metal conduit (EMT) from the home improvement store. Hand quilters use the very same no baste frame. And this simple, inexpensive, expandable no baste frame is only $170. The over all size of this top is about 36.5" by 44.75" making it crib size.